Salsa means a mixture of things, or any kind of sauce. It can be savory or sweet. Most of the Salsa you’ll find in the store has 1/8″ chopped tomatoes, red peppers, onions, lemon and or lime juice. It can also have garlic, jalapeño peppers, avocado, cilantro corn, olive oil etc, etc. It is great for dipping corn chips or to add to a flour tortilla. My favorite is Pico de gallo or Salsa cruda. Store bought salsas have vinegar and or have been cooked to increase shelf life. That usually takes away from the flavor of the fresh ingredients. In Mexican cuisine, Pico de gallo (Spanish for “rooster’s beak“) is a fresh condiment made from chopped tomato, onion, and chiles (typically jalapeños or serranos). Other ingredients may also be added, such as lemon or lime juice, fresh cilantro (leaf of coriander), avocado, cucumber, or radish. 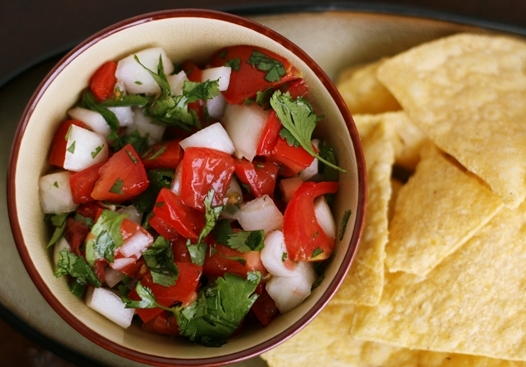 In some regions of Mexico, a fruit salad tossed in lime juice and sprinkled with a salty Chile powder is also known as pico de gallo, while the tomato-based condiment is better known as salsa picada, which means minced or chopped sauce, or salsa mexicana, because the colors red (tomato), white (onion), and green (chile) are the colors of the Mexican flag. Pico de gallo can be used in much the same way as Mexican salsas or Indian chutneys, but since it is less liquid, it can also be used as a main ingredient in dishes such as tacos and fajitas. Salsa roja, “red sauce”: used as a condiment in Mexican and Southwestern cuisine, and usually made with cooked tomatoes, chili peppers, onion, garlic, and fresh cilantro. 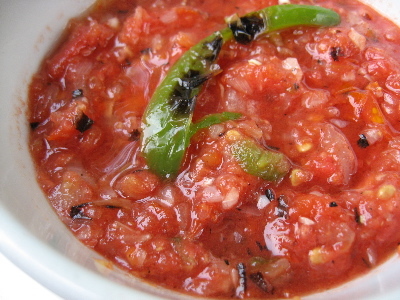 Salsa cruda (“raw sauce”), also known as pico de gallo (“rooster‘s beak“), salsa picada (“chopped sauce”), salsa mexicana (“Mexican sauce”), or salsa fresca (“fresh sauce”), “salsa bandera” (“flag sauce”, in allusion to the Mexican flag): made with raw tomatoes, lime juice, chilli peppers, onions, cilantro leaves, and other coarsely chopped raw ingredients. Salsa verde, “green sauce”: Mexican version made with tomatillos. Sauces made with tomatillos are usually cooked. Italian version made with herbs. Salsa taquera, “Taco sauce”: Made with tomatillos and morita chili. 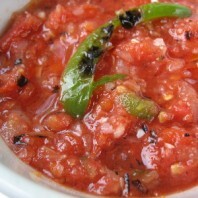 Salsa ranchera, “ranch-style sauce”: made with tomatoes, various chilies, and spices. Typically served warm, it possesses a thick, soupy quality. Though it contains none, it imparts a characteristic flavor reminiscent of black pepper. Salsa brava, “wild sauce”: a mildly spicy sauce, often flavored with paprika. On top of potato wedges, it makes the dish patatas bravas, typical of tapas bars in Spain. Guacamole: usually any sauce where the main ingredient is avocado. Mole (pronounced mole [‘mo.le]): a Mexican sauce made from chili peppers mixed with spices, unsweetened chocolate, almonds, and other ingredients. Mango Salsa: a spicy-sweet sauce made from mangoes and used as a topping for nachos. It is often also used as a garnish on grilled chicken or grilled fish due to the sauce’s gamut of complementary flavors. Make your own, it is much fresher and has not additives, But remember to refridgerate it and don’t leave it out too long. It is raw and can develop E. Coli. High quality natural honey can be distinguished by its fragrance and taste. The best period to stock up on honey is in summer, when it is being collected in large quantities. The ripe, freshly collected, high quality honey at 20°C (68°F) flows from the knife in a straight squirt, without breaking into separate drops. After falling down the honey should form a clear hillock. The ripe honey is being collected from the sealed honey combs; therefore it should always be of high quality. The honey should not lay down in layers. If this is a case, it indicates the excessive humidity (over 20%) of the product, and such a honey would not be suitable for long term preservation. A fluffy thin layer on the surface of the honey (like a white foam), or marble-coloured and white spots in crystallized honey at the wallsides of the bottle are caused by filling of liquid honey with subsequent sealing—the air bubbles are surfacing and part of them is concentrated at the wallsides. This is an indication of a high quality honey, which was filled without pasteurization (heating). If the honey is transparent, burning with amber-like colours, then (unless it is very fresh) it has most likely been heated. Transparent and reluctant to thicken honey can also indicate its being a result of feeding the bees with sugar syrup or even sugar itself, which is bad both for the bees and for the honey they produce, as naturally they are supposed to feed on flower nectar. A true honey that is at least one month old is usually of demure (not translucent) colours. Maple syrup is a sweetener made from the sap of maple trees. In Canada and the United States it is most often eaten with waffles and pancakes. It is sometimes used as an ingredient in baking, the making of candy, preparing desserts, or as a sugar source and flavoring agent in making beer. Sucrose is the most prevalent sugar in maple syrup. It was first collected and used by Native Americans/First Nations and was later adopted by European settlers. white wine for cooking is used mostly in white or light tasting sauces. Only one thing to know about cooking with wine. Always use a wine that you could drink. If you don’t like it, don’t use it. same a white wine, except red wine is used mostly in tomato based dishes or heavier meaty gravies. I added mango chutney because Mittie suggested it. I don’t usually use chutney, but it can be very good. Lets see what we can find out about Mango chutney. Cut the mango flesh away from the pit. The pit is shaped similar to an obelisk, so you’ll end up with 2 large pieces and 2 smaller pieces from each mango. Roughly chop the flesh. In a saute pan heat the oil and add the chile flakes. Be careful not to burn the chile, just toast to flavor the oil. Add the onions and sweat until soft. Add the ginger and bell pepper and saute for 1 to 2 minutes. Finally add the mango and cook for 1 more minute. In a separate bowl, combine the pineapple juice, vinegar, sugar, and curry powder. Add this mixture to the pan. Stir to combine. Bring the mixture to a bare simmer and reduce for about 30 minutes, stirring frequently. Season with salt and pepper. Add the raisins and the nuts and transfer to another container over an ice bath. I used a mild yellow curry powder, but if you want it hotter go for red. Chutneys of all types are generally served with a hot or spicy dish to allow the sweetness to balance the flavors. If you have some good ideas on how to use chutney let me know.